The first committee we will focus on is the Accountancy Licensee Database (ALD)/CPAverify Committee. The ALD is a central repository of current licensee and firm information. It was conceptualized to assist boards of accountancy with their regulatory mission. Ideally, the database will continue to grow to include the current licensing information for individual accountants and firms in each of the 55 jurisdictions. ALD is hosted by NASBA and access to the system is free to executive directors and authorized staff of all state boards of accountancy. CPAverify is the public version of the ALD. Free and open to the public, CPAverify.org is an online CPA lookup tool populated by official state regulatory data sent from state boards of accountancy to a central database. It is populated by the same data as the ALD, and is the first and only single-source national database of licensed CPAs. Appointed in 2008, this Committee’s goal was to assist boards in overcoming any obstacles to participating in the ALD. The group’s focus has shifted from promoting the concept and allaying privacy concerns to assisting and advising staff in areas of policy, solving areas of problems or concern and helping garner approval of major initiatives and activities. The committee’s charge is to achieve recognition and acceptance of the Accountancy Licensee Database and CPAverify by all boards of accountancy and relevant stakeholders. Today, 40 boards are contributing licensee information to the ALD, and in less than 12 months since CPAverify was launched, 12 additional states added their data, bringing the total number of states in CPAverify to 35. The 40 states live in the ALD comprise approximately 82 percent of all regulated CPAs, leaving only about 18 percent of regulated CPAs left to add to the national database. In CPAverify, the 35 live states make up about 78 percent of the regulated CPA population. A great initiative is being made now by NASBA and the committee to have the participation of all jurisdictions in both the ALD and CPAverify. The database becomes more robust with each state implementation and enhances both communication across state lines for board staff and consumer protection. This year, the committee has several initiatives it hopes to accomplish. 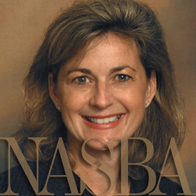 Elizabeth Stanton, NASBA’s ALD Manager and NASB committee staff liaison, said one of those initiatives is to work toward real-time capability with the participating boards of accountancy. One way to accomplish this is through establishing an automatic data feed from the boards. Stanton also said the committee will continue to place an emphasis on examining database reliability through its daily, weekly and annual processes in order to monitor data integrity. To learn more about the ALD and CPAverify, please read the ALD Newsletter available in the Publications section of this website. To see a list of participating NASBA volunteers on this committee, please visit the ALD/CPAverify Committee page in the Committees section.